As a video game designer, East Village-native David Gilbert creates brand new worlds, full of weird and interesting characters. He prefers to keep them on his doorstep. 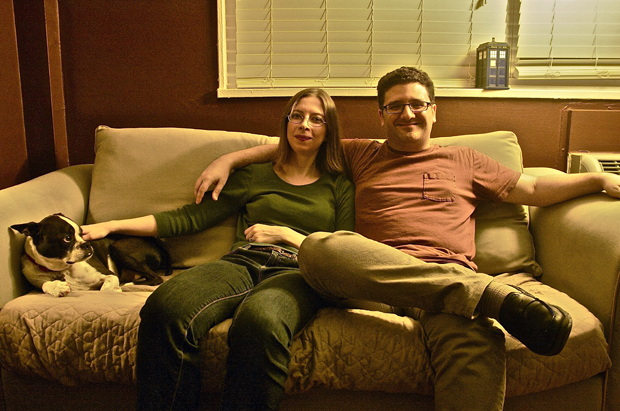 The founder of Wadjet Eye Games, Gilbert and his wife Janet, earn a living making games based on their neighborhood. “You write what you know,” David said. The company’s first game, “The Shivah,” designed by David in 2005, mostly in coffee houses all over the East Village and Tribeca, follows a grieving Rabbi around the lower East Side in an effort to save his struggling Synagogue. Along the way, he gets involved in a sinister plot and must travel all over the city to find the truth. Wadjet Eyes’ magnum opus, “The Blackwell Saga,” continues the trend, as it follows a psychic detective and her spirit guide all over the East Village solving mysteries. David spent a bulk of his childhood playing games, but not the ones that feature fuzzy hedgehogs or overweight Italian plumbers with Rollie Fingers mustaches. He played point and click adventures that rely on a heavy narrative and interesting characters, rather than jumping on enemies and collecting coins or rings. After a year teaching English in Korea, he moved in with his retired parents. Without an apartment or job, he spent his time in coffee houses on his laptop and started designing games for fun. After a month, he decided to make a career of creating the video games he played as a kid. An admitted workaholic, David didn’t have much time for love at this point in his life, especially after “The Shivah,” got several good reviews and his later creation, “The Blackwell Saga” did just as well. But at the Game Developers Conference in San Francisco in 2007, love found him. Without a place to sit for a panel, Janet, an England-native, sat next to him. They kept in touch and eventually met up again before marrying in 2009. Janet’s arrival in his life ended up doing more than completing him emotionally. With her experience as a programmer for several different video game companies and technical knowhow, she’s the perfect accent to David’s creativity. In addition to coding all of the company’s games, Janet also finds the technical bugs in David’s creations before they’re shipped out to customers. “Dave’s last game didn’t have many,” she said. Everything, even the voice acting for their games, takes place in the apartment. With a comfy couch, two computers and a 42-inch flat screen TV, it’s functional; but with loads of comic books and video games neatly organized around the house, posters of the games they’ve created hanging in glass frames and a mini “Doctor Who” TARDIS on a window shelf, it’s home to them. If there was any confusion that this was a home as well as a video game studio, Gilberts’ 10-year-old Boston terrier, Cooper, who is listed on the company’s website as their CDO [Chief Dog Officer] puts those thoughts to rest. Cooper has also made in appearance in one of their games. David’s added responsibility as a husband has also benefitted the company, as the Gilberts’ have also begun to branch out and publish other people’s games. Earlier this year, they published a futuristic noir title, “Gemini Rue,” which was produced by UCLA undergraduate Joshua Nuernberger. Their goal is to build their company and make it a destination for young designers. They also have plans to start a family in the near future. One David didn’t see five years ago. Keep making games. They rock.